Ashley Holzer and Havanna 145 won the FEI Grand Prix Freestyle CDI 3*. 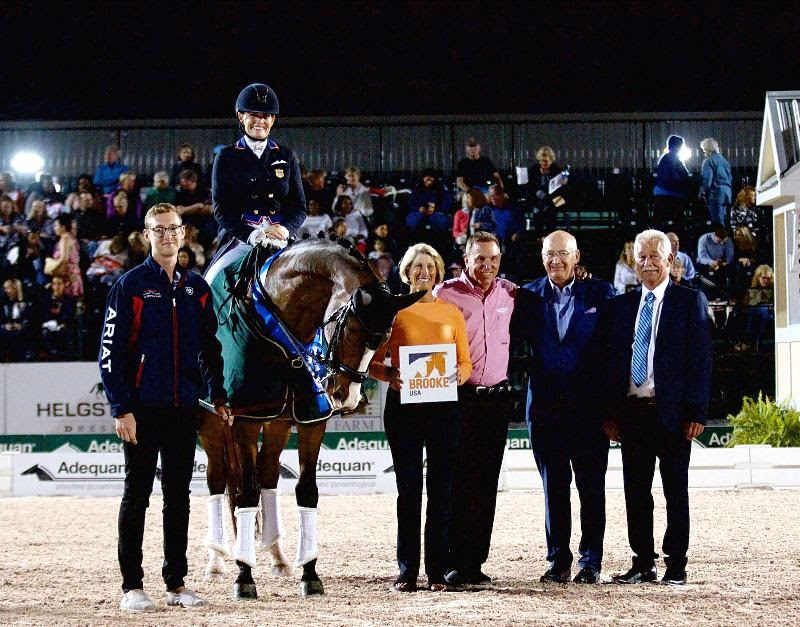 They are pictured with Nate Tucker, Brooke USA Board Member Marcia Kulak, Allyn Man from Adequan, Michael Stone, president of Equestrian Sport Productions and judge Stephen Clark. Photo by EQ Media. The sponsorship of the week's FEI CDI 3* division was graciously donated by longtime supporters, Fritz and Claudine Kundrun to increase exposure for the organization that works to improve the lives of working horses, donkeys and mules and the people that rely on them in the poorest regions of the world. 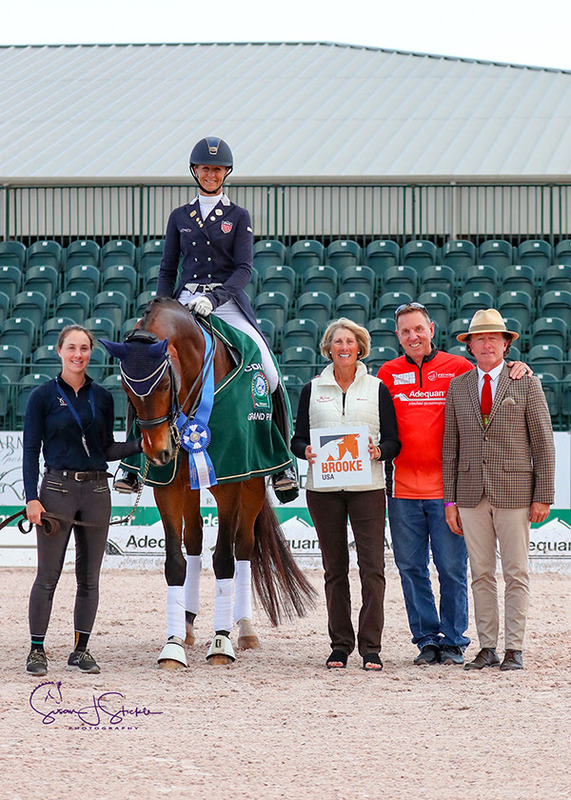 Brooke USA headlined the FEI CDI3* Grand Prix and the FEI Grand Prix Freestyle. The Kundruns are animal lovers and supporters of the sport of dressage. After living in Pakistan, Fritz Kundrun was determined to help the plight of working equines, and with his wife, Claudine, has made it a priority. The Kundruns are Patrons of the Dorothy Brooke Society, which honors the passion and determination of Brooke’s founder, Dorothy Brooke. This giving society recognizes Brooke USA’s philanthropic leaders. They are also recipients of the inaugural Brooke USA Crystal Award, presented at Brooke USA’s Sunset Polo™ and White Party on March 22. Heather Blitz and Semper Fidelis for the FEI Grand Prix CDI 3*. Brooke USA also creates awareness of the organization’s goals through its brand ambassadors and advocates. Olympian and chef d’equipe of the U.S. Dressage team Debbie McDonald, eventer Boyd Martin, show jumper Hannah Selleck, para-dressage rider Katie Jackson and Olympic medalists Kasey Perry-Glass and Allison Brock are some of the notable equestrian figures who represent Brooke USA as ambassadors. Brooke USA Board Member and international three-day competitor and trainer Marcia Kulak represented the organization during the award presentations.